Win One of Two Free Waste King Bundles! This months edition of KBB is now out in the shops and on page 166 you’ll find details of our competition. KBB have teamed up with us to offer 2 free Waste King bundles to the lucky winners who only need to answer a simple question. To save you buying a copy we are repeating the details below or you can enter here. There are many reasons for investing in a food waste disposal unit. Firstly, it can dispose of your kitchen food waste easily and instantly, including any leftovers, peelings and even fish and poultry bones. Secondly, it is hygienic since rotting kitchen waste isn’t left hanging around, attracting insects and vermin. What’s more, it also saves on disposal costs and the hassle and smells of composting. Waste King is the largest global disposer brand, operating for over 60 years, and is consistently rated as number one in its class. It is now available in the UK exclusively from The Hunter Fan Company. The Waste King leads the way in the market thanks to its simple, robust design that delivers three times the power of its competitors, meaning that it never jams, and grinds finer and quicker. In addition, the Waste King uses ultra-strong cast stainless-steel impellers, a tough corrosion-proof grinding chamber, a large opening for ease of use and removable splashguards for easy inspection. A Waste King is also a green choice. In the UK, some 19 million tonnes of food waste are dumped into landfills each year. This rots down to produce harmful carbon dioxide and methane gases. With a Waste King, however, it ends up at the sewage treatment works where it is broken down into biosludge. Here it is converted into biogas and, in turn, electricity. 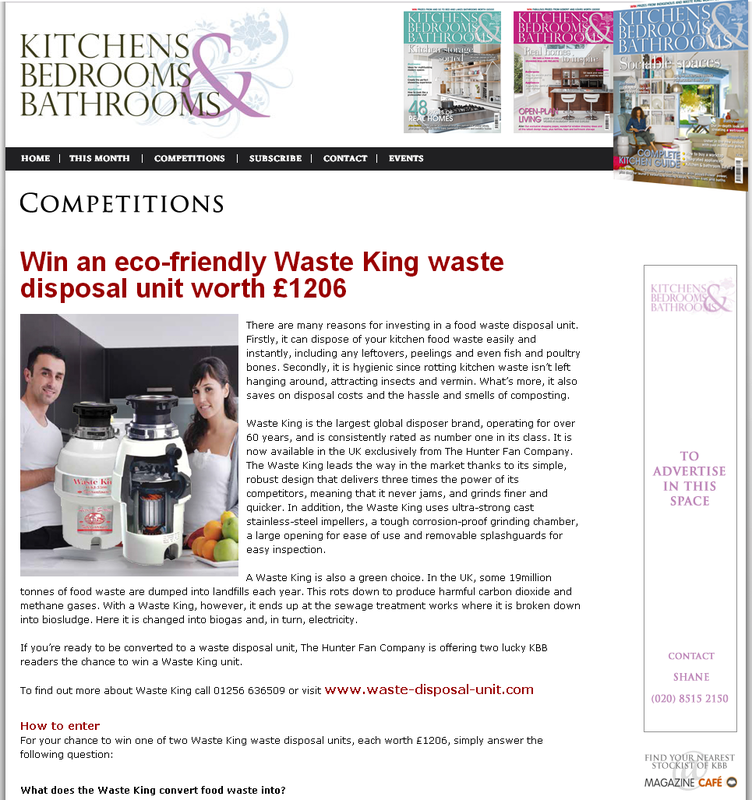 If you’re ready to be converted to a waste disposal unit, The Hunter Fan Company is offering two lucky KBB readers the chance to win a Waste King unit. What does the Waste King convert food waste into? Congress House, Lyon Road, Harrow HA1 2EN. 1 The prizes are as stated and no cash alternative will be given 2 The prize does not include installation 3 The closing date is 31 May 2014. Only one entry is permitted per household 4 The winners must take up their prize within six months of the closing date 5 The editor’s decision is final 6 The competition is open to UK mainland residents only 7 The competition is not open to anyone employed by Taylist Media or to The Hunter Fan Company employees 8 These prizes are supplied by The Hunter Fan Company. In the event that the supplier becomes insolvent, we the publishers will not be liable to provide the prizes 9 For postal entries, please indicate if you do not wish to be contacted by Taylist Media or The Hunter Fan Company 10 No purchase of the magazine is necessary. I am a director of The Henley Fan Company Ltd which imports, stocks and sells mechanical rotating products - ceiling fans and waste disposal units. These are top quality products from leading brands (most with a lifetime warranty) that I genuinely believe will improve people's home comfort and quality of life whilst making valuable energy savings and helping the environment at the same time. I am a chartered accountant with an MBA in Finance from Cass Business School and also a chartered chemical and European engineer. Easter Weekend Promo – 20% off!